Examining contemporary poetry by way of ethnicity and gender, Kenneth Lincoln tracks the Renaissance invention of the Wild Man and the recurrent Adamic myth of the lost Garden. He discusses the first anthology of American Indian verse, The Path on the Rainbow (1918), which opened Jorge Luis Borges' university surveys of American literature, to thirty-five contemporary Indian poets who speak to, with, and against American mainstream bards. From Whitman's free verse, through the Greenwich Village Renaissance (sandwiched between the world wars) and the post-apocalyptic Beat incantations, to transglobal questions of tribe and verse at the century's close, Lincoln shows where we mine the mother lode of New World voices, what distinguishes American verse, which tales our poets sing and what inflections we hear in the rhythms, pitches, and parsings of native lines. 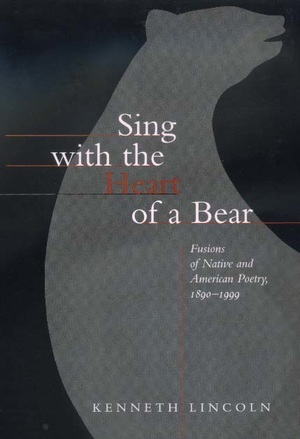 Lincoln presents the Lakota concept of "singing with the heart of a bear" as poetry which moves through an artist. He argues for a fusion of estranged cultures, tribal and émigré, margin and mainstream, in detailing the ethnopoetics of Native American translation and the growing modernist concern for a "native" sense of the "makings" of American verse. This fascinating work represents a major new effort in understanding American and Native American literature, spirituality, and culture. Kenneth Lincoln is Professor of English at the University of California, Los Angeles. He is the author of A Writer's China (1999), Men Down West (1997), Indi'n Humor (1993), The Good Red Road: Passages into Native America (1987), and Native American Renaissance (1983).